The path to recovery after stroke is not always straight-ahead. As patients and caregivers define a new normal, support from family and friends matters as much as it did in the time of a medical emergency. 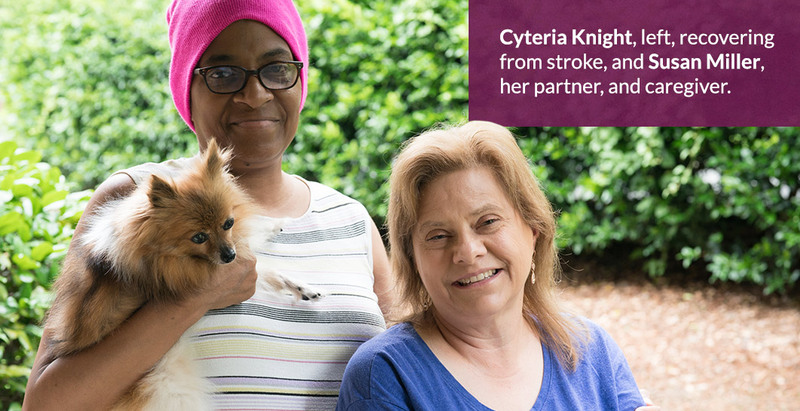 Stroke survivor Cyteria Knight, of North Carolina, and her partner and caregiver, Susan Miller, the main author of Cyteria’s CaringBridge website, describe the healing power of support. Appreciating the benefits of support on healing, CaringBridge is now partnering with the American Stroke Association, whose mission is to teach the globe that stroke is treatable, and that ongoing support from loved ones is vital to recovery. In the United States, someone suffers a stroke every 40 seconds. World Stroke Day, annually observed on Oct. 29, underscores the serious nature and high rates of stroke, raises awareness of the prevention and treatment of stroke, and highlights the importance of better care and support for survivors. A growing number of people are recovering from stroke with little to no disability, especially when treatment begins without delay. If you spot such common stroke symptoms as Face drooping, Arm weakness or Speech difficulty, it's Time to call 911. Learn more about stroke detection, prevention, treatment and recovery at www.StrokeAssociation.org. Top tips on using CaringBridge to get support after stroke. CaringBridge users recovering from stroke offer tips for talking with—not at—people who have aphasia. Cyteria Knight says focusing on the positive helps families approach life during recovery from stroke.